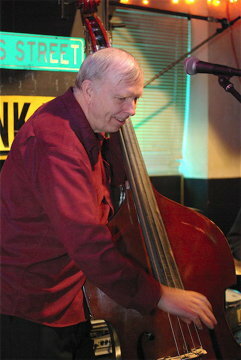 Bryan Big Woody Smith's bass sound first gained international exposure in the mid-Seventies when he recorded and toured in the U.S. and Canada as a member of The Star Spangled Washboard Band. He worked with Bob Newscaster in the Tennessee Rockets, appearing on the Ripsaw classics, Bad Boy and Hot Rod Man with Tex Rubinowitz as well as Shakin' That Rockabilly Fever with Billy Hancock. From 1980 through 1990, Bryan enlisted in the U.S. Navy, performing with the U.S. Navy Band, Country Current, featuring some of the best country and bluegrass musicians in the world. Bryan has performed with many bands in the D.C. Metro area playing country, blues, R&B and rockabilly.